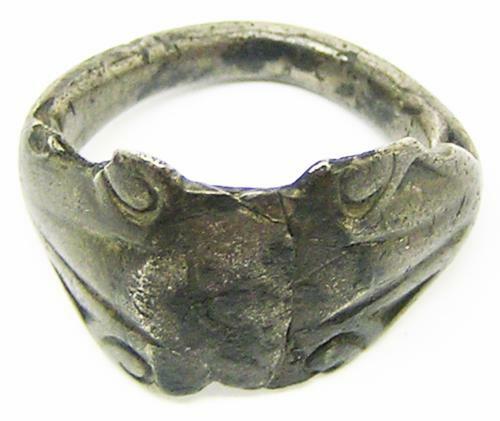 This is an ancient Roman silver finger ring of Henig Type VIII (keeled type), dating to the 3rd century A.D. The ring is of a good size, with a plain bezel and decorated shoulders. A similar 'keeled' type ring in silver is further discussed at GLO-8C3E10. This example has been formed from a rod of silver, the terminals hammered and flattened, curled around and joined together to form the bezel. The line in the centre of the bezel is not a crack, but where both terminals form an overlapped join. It is still quite solid and without movement. This may have originally been covered over with a raised rim to hold a gemstone or intaglio. It is a great looking piece, robust and perfectly wearable today with consideration! PROVENANCE: Ex. private collection, Essex.